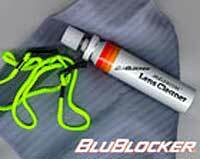 The BLUBLOCKER® Lens Cleaning Kit is the perfect accessory to keep your sunglasses streak-free and looking like new. The non-toxic, hypo-allergenic spray, dissolves oils and removes fingerprints. The lint-free cloth wipe is so soft it won’t scratch and works perfectly with the spray cleaner.